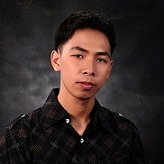 Is there a way to filter the HTML-Table-Listing-Report? (Or another grid report) I have been using the Visual Report builder so that I can filter the results, but I am also limited by the 100 submission issue. In the HTML Tabling Listing Report and Grid Listing Report, you have the up and down arrow keys that allows you to sort the submissions in ascending and descending order. However, you cannot filter specific data. If you would like, you can also integrate your form to Google Spreadsheet, here's a guide about it: https://www.jotform.com/help/228-How-to-Integrate-Form-with-Google-Spreadsheet. With Google Spreadsheet, you can create basic to advance report presentations, with more advance data analysis. I could also forward a feature request to our developers to make Visual Report builder improve the limit in the grid to more than a 100. But I am not quite sure what specific filter function you would like to have. Perhaps you could provide us more information on it so that I can escalate it better. I want to filter the submission report by the “Professor” field so that each professor only views her submissions. I see you are already applying the filter option in Visual Report builder. Unfortunate, the grid table in the Visual Report builder is limited to only 100 submissions. I'll forward this to our developers to see if they can make improvements on it. However, I'm unable to guarantee that the change will be implemented anytime soon. Let's say you have 100 submissions from January to March of 2016, you then need to create another visual report with a submission date range of April to June of 2016 for submissions number 101 and up. We will update you on this thread as soon as we hear any news from our developers. Apologies for the inconvenience. Thanks. I didn't think about adding the submission date filter. No worries, I'm glad it helped you somehow. I see that the ticket I escalated has now been assigned to one of our developers. In case we hear any news about the issue on the 100 limit in Visual Report Builder, we'll update you immediately here. Thank you for your understanding. The submission date filter didn’t seem to help. 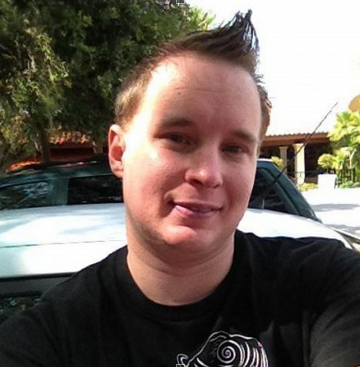 The latest I can get to show up is March 30. And I know there are some submissions for April. Thank you for the update about that and we can understand how that might seem a bit frustrating. I can confirm that Charlie has sent notice of the problem to our developers and we already have it assigned to be looked at as soon as possible so we'll update you as soon as we can once it's fixed. No, the last submission displayed is still in March. Unfortunately, the issue about the 100 limit in the grid list in the Visual Report builder is not yet fixed, I have opened a separate thread for you, you can refer to this link instead: https://www.jotform.com/answers/827559. Apologies for the inconvenience. Apologies for the inconvenience. I see you are using the filter option "Last 30 days", may I know if you have tried setting a custom date range instead? 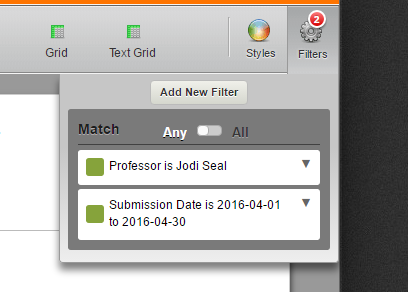 If you disable the filter "Professor is Jodi Seal", you can see that the submissions in April will be displayed. There might be a problem when trying multiple filters at the same time. I also checked the status of the bug report, I'm sorry to say that it is still unresolved by our development team. We will hear from them directly about this. Apologies. I tried the custom date range option as well - no luck. 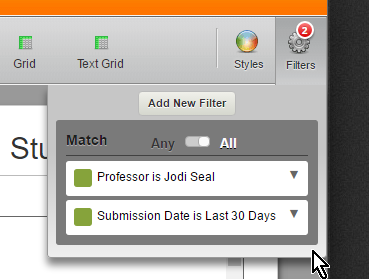 I need the Jodi Seal filter because I am trying to create reports for each professor. The date is only there because of the 100 submission limit. Sorry for the inconvenience. Our development team is still working on this issue. Rest assured that once this issue has been fixed we will inform you via this thread. Regards. The 100 limit on visual report grids has now been removed. Apologies for any inconvenience caused.